At Achievement Center of Texas, students have individual service plans which include Day Habilitation goals. Teachers work with the students on these goals as well as others to give the students every opportunity to become as independent as possible. We want our students to enjoy the process of learning in a safe, healthy, educationally-stimulating atmosphere. Students move from one classroom to another to train in the various skills provided by the teachers. 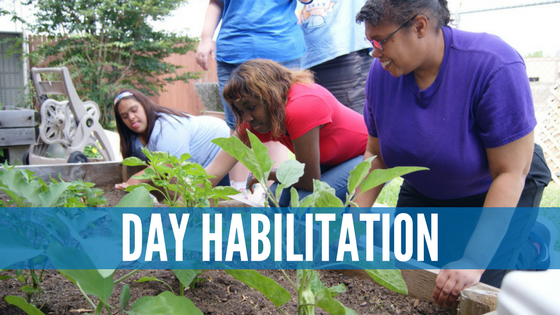 What’s the Difference between Day Habilitation and Life Skills? Students oftentimes use the Life Skills Lab to acquire these skills. Life Skills is a class all on its own that occurs several times throughout the week. Activities in Life Skills are often lengthier and include more attention to detail than Day Hab activities. However, Day Hab takes places every single day and focuses on applying simple methodology to teach basic, practical skills. We hold Special Needs Day habilitation classes from 8:30 a.m. to 3:30 p.m. Monday through Friday. At ACT, we provide our students with a fully equipped apartment inside the building. Within it, they can learn and practice functional living skills on a daily basis. We also have a library with countless books for students who want to read or have the desire to learn. Students can also enjoy being read to by teachers or other students. Inside the library, we set up nine computers for students who desire to develop computer skills.